Now that Turkey is at loggerheads with its erstwhile ally, the United States, the country’s currency crisis has morphed into a political problem of the first order. The immediate issue is Turkey’s refusal to release the American pastor Andrew Brunson, who is being held on charges of terrorism, espionage and subversion for his alleged role in the failed July 2016 coup against Turkish President Recep Tayyip Erdoğan. The US government is right to object to Brunson’s detention. But its reaction has been counterproductive. In particular, the imposition of additional US tariffs on imports of Turkish steel and aluminium could further undermine confidence in Turkey’s economy, triggering a wider crisis that would do serious harm to the global economy. Moreover, tariffs allow Erdoğan to blame his country’s economic woes on America, rather than on his own government’s incompetence. It is still possible that the Turkish government will find a way to release Brunson, and that US President Donald Trump, anxious to demonstrate fealty to the evangelicals who form a core part of his base, will rescind the tariffs. But even if the immediate crisis is resolved, the structural crisis in US–Turkish relations—and Western–Turkish relations generally—will remain. We are witnessing the gradual but steady demise of a relationship that is already an alliance in name only. Though the Trump administration is right to have confronted Turkey, it chose not only the wrong response, but also the wrong issue. 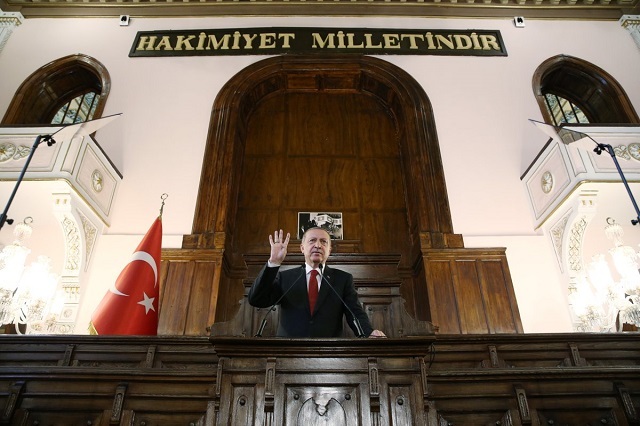 Under Erdoğan, checks and balances have largely been eliminated from the Turkish political system, and the president controls the media, the bureaucracy and the courts. The same failed coup that Erdoğan cites as grounds to imprison Brunson has also served as an excuse for detaining thousands of others. At this point, it is impossible to see how Erdoğan’s Turkey could ever qualify for EU membership. The second principle underlying Turkey’s ‘Western’ status is alignment on foreign policy. Turkey recently bought more than 100 advanced F-35 fighter jets from the US. Yet, in recent years, Turkey has also supported jihadist groups in Syria, moved closer to Iran, and contracted to purchase S-400 surface-to-air missiles from Russia. Some might say that the current level of US–Turkish friction is nothing new; the two countries have long had their share of differences. The Turks were not happy with the US decision to withdraw medium-range missiles from Turkey as part of the deal that ended the 1962 Cuban missile crisis. The two countries clashed repeatedly over the Turkish intervention and subsequent occupation of Northern Cyprus in 1974, and over US support for Greece. Turkey refused to give US military forces access to Incirlik Air Base during the Iraq war in 2003. And in recent years, the Turkish government has been infuriated by America’s refusal to extradite the Pennsylvania-based cleric Fethullah Gülen, whom Erdoğan believes masterminded the 2016 coup attempt. The problem is that the NATO treaty provides no mechanism for divorce. Turkey can withdraw from the alliance, but it cannot be forced out. Given this reality, the US and the European Union should maintain a two-pronged approach towards Turkey. First, policymakers should criticise Turkish policy when warranted. But they must also reduce their reliance on access to Turkish bases such as Incirlik, deny Turkey access to advanced military hardware like F-35s, and reconsider the policy of basing nuclear weapons in Turkey. Moreover, the US should not extradite Gülen unless Turkey can prove his involvement in the coup with evidence that would stand up in a US court and satisfy the provisions of the 1981 mutual extradition treaty. Nor should the US abandon the Kurds, given their invaluable role in the fight against the Islamic State. Erdoğan recently warned  in the New York Times that the US–Turkish partnership ‘could be in jeopardy’, and that Turkey would soon start looking for new friends and allies if US unilateralism and disrespect were not reversed. In fact, the partnership was already in jeopardy, largely because of Turkish actions, and Erdoğan had already begun the process of looking for new friends and allies. It is time for the US and Europe to adjust to this reality. Richard N. Haass is president of the Council on Foreign Relations and author of A world in disarray: American foreign policy and the crisis of the old order. This article is presented in partnership with Project Syndicate © 2018. Image courtesy of Recep Tayyip Erdoğan on Twitter.